Philocrites: Beacon Hill office bird-watching. 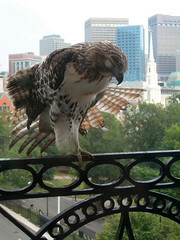 Bird-watching readers: Is this really a falcon? Previous: Devin + Trevor = Trevon? Next: Who's afraid of freedom and tolerance? You were trying to keep up? Fortunately, as it is written, man does not live by Middle English recipes alone. Looks like a red-tailed hawk. The markings look right, and falcons don't usually have a tail-spread like that. It's an immature light-morph red-tailed hawk who's just come into adult plumage this summer. It visits my balcony regularly. I thought it was a falcon until it kept growing and turned stripey. I've seen it eat a squirrel. It almost fell off the head of the statue outside my office when it fell asleep there last week. I'm rather fond of it. Any name suggestions?